The new Healthcare legislation - Bill 74 People's Health Care Act, gives sweeping NEW POWERS to government & it’s appointees to order MEGA-MERGERS, AMALGAMATIONS, TRANSFERS, CLOSURES and PRIVATIZATION. 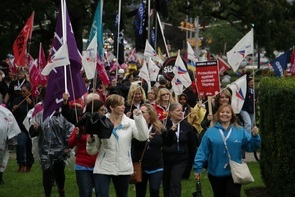 Come out to Queen's Park 12noon and bring your flags! Go to Ontario Health Coalition to learn more about the legislation and what you can do about it. Everyone welcome. Click on image to download the flyer. ​Statement on Supporting Children & Youth with Autism, and their families. Click to read statement. Find out what union membership can do for you and how it can change your work life. Click here to view our locals and their Collective Agreements.